Twenty-five years ago, on 4 Nov. 1990, a priest risked his life to hold a mass in a cemetery in Albania. In 1967 his president, Enver Hoxha, had declared that he had “abolished” the Christian faith, and that his country was henceforth the world’s first atheist state. On 4 Nov. 2015, Albania’s current president hosted an official palace reception for 145 church leaders – from the Vatican to Venezuela – who for the previous three days had met in the aptly-named Resurrection of Christ Orthodox Cathedral. Their conference tackled one of the most pressing issues facing the global Church: the discrimination, persecution and martyrdom faced by millions of its members – from Iraq and Syria to India and Pakistan, from Cuba to Myanmar, from Sudan to Iran, and from Algeria to Kenya to Nigeria. It marked a historic moment in more than its choice of country and timing. For the first time in the modern history of Christianity, high-level leaders and representatives of the various Church traditions – Orthodox, Catholic, Protestant, Evangelical and Pentecostal – met together. In another twist, they stayed on the spot where, until its 1967 demolition, had stood the former Orthodox Cathedral; it was replaced in 1974 by a hotel. 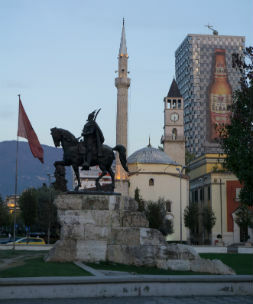 On the opposite corner of the capital’s central Skanderbeg Square is the National Museum. A visit there shows moving memorabilia of Albania’s communist era: photo after photo of priests killed by their own government. After the desolation of that era, the Orthodox Cathedral has been rebuilt only a few blocks from where it stood before. So, given its own “resurrection”, the Albanian Church, in another show of Christian unity, wanted to show their fellow believers suffering in places such as Syria, Iraq and Nigeria that even when Christianity is officially declared “dead”, it’s not the end of the story, much as in the life of Jesus. “We have come together because discrimination, persecution and martyrdom among Christians and people of other faiths in the contemporary world are growing due to a complex variety of factors in different realities and contexts”, the organisers wrote in their final message. The 21st Century, they said, is full of moving stories of faithful people who have paid for their dedication to Christ through suffering, torture and execution. One objective of the meeting was “to listen to, learn from, and stand with discriminated and persecuted churches and Christians in the world today”. It heard hard-hitting testimony from, for example, the former Syrian Catholic Archbishop of Mosul, Basilios Georges Casmoussa, now based in Lebanon. About the destruction wrought by the self-proclaimed Islamic State, he said: “Is this not socio-cultural genocide for the Christians of Iraq? Genocide is more than the physical massacre of a people; it’s also the systematic massacre of its social bonds, of its culture, of its historic and collective memory, of its future, of its active presence in the land of its ancestors. The Christians in the Nineveh Plains experience daily deprivation. If the Nineveh Plains empties of Christians, all of Christianity in Iraq is threatened with extinction”. In their concluding statement, conference participants “acknowledged that solidarity among Christian churches is needed to strengthen Christian witness in the face of discrimination, persecution, and martyrdom … We need to urgently strengthen the solidarity of all Christians, following up on what has been accomplished with insight and discernment from this consultation”. At another point, Rev. Dr. David Wells, representing the Pentecostal World Fellowship, movingly apologised to those representing the historic denominations for the ignorance often shown by newer denominations of the Church history from which their inheritance has come. A tone of self-reflection was set early, in the first keynote talk, given by Dr. Andrea Riccardi, a professor of contemporary history at Rome University. As a 17-year-old in 1968, he had challenged his Rome high school classmates, “If we take the Bible seriously, how would we live?” A group of those middle-class youths moved into a run-down area of Rome to live among the poor. Out of that experience Riccardi founded the Community of Sant’Egidio (St. Giles), which has spread to 70 countries, and is among the global leaders combating HIV/AIDS. 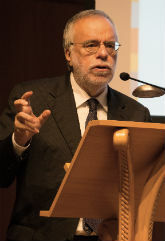 Riccardi reminded the audience of his friend Christian de Cherge, prior of a monastery in Algeria, most of whose monks were kidnapped, and later beheaded, by an armed Islamic group in March 1996. (Their story is the subject of the 2010 film ‘Of Gods and Men’.) He remembered too the Syriac Archbishop of Aleppo, Yohanna Ibrahim, kidnapped in April 2013 “because he was a generous believer” and went with a friend to attempt negotiations with Islamist extremists. The fate of the two men is still unknown; they are thought to be captive still. “How can we remain the same, when we know these men … have shared the same table as them?” Riccardi said. He had begun his keynote by suggesting an explanation for that challenging question. “The West has had little awareness of the martyrdom of Christians,” Riccardi said. “Western culture has nurtured a sense of guilt over the responsibility of Christians and the violence perpetrated by them in their history. This consciousness, which has its reasons, concealed an important reality, which runs through the 20th Century: the persecution of Christians. Christian communities, closed on themselves or self-centred, do not hear the question and the cry that comes from a world of men and women of faith, humiliated and persecuted. They do not feel the searing memory of the history of the 20th Century. This insensitivity and ignorance of the past intertwine”. But he challenged: “Very often churches and Christians have refused to meet Him in the living body of the humiliated brothers, because they were of another Christian denomination, because they were of a different nationality, because distant or inconvenient”. But why, he asked, are Christians still dying in this millennium? “To answer this question, we must retrace the many stories of persecution, which show that the 21st Century is a new time of martyrdom”, he said. “These figures, with their humanity and their actions, represent a different way of living: this is unacceptable to the prevailing fanaticism or for the interests that aim for the dark control of society. Christians cannot be subject to the logic of conflict. They educate the young generation in a responsible way in life, they do not cooperate with criminal or repressive powers, they are friendly and human, they communicate their faith. Despite the weakness or minority status, without using any armed force, the Christian is in fact a meek alternative to the prevailing ideology or power. For this reason, they will be put aside, silenced, eliminated”. He cited examples such as Annalena Tonelli, an Italian volunteer in Somalia killed in 2003, “whose hospital was a human space in the barbaric situation of Somalia. Despite the threats, she did not flee … She gave witness to a generous and peaceful life in the violent and degraded Somali environment”. American nun Dorothy Stang, he said, was killed in 2005 in the Brazilian state of Para, at the age of 73. “Threatened for years, she made the intimidation public”, Riccardi said. “Her commitment to the ‘landless’ clashed with landlords, who saw in her an obstacle to the exploitation of precious woods. Two gunmen stopped her and asked her if she had weapons. Sister Dorothy showed a Bible: ‘Here is my only weapon.’ She was found murdered, bent over her Bible”. Riccardi mentioned two brothers of his own Sant’Egidio order. “One in Congo, Floribert, the young director of customs who, despite the attempts of bribery and threats, refused to allow rotten food on the market. He resisted in the name of faith and was assassinated. Another young Christian in El Salvador, William, working alongside poor children, was threatened and asked to join the mafia. He refused and continued his service in a very dangerous corner: he was killed”. He said these examples prove that, beyond the current news headlines of Christian martyrs at the hands of IS and Nigeria’s militant Islamist Boko Haram insurgency, “Christianity continues in the 21st Century to produce people who are generous and faithful in the service of others in a disarmed way. These people are obstacles to evil projects, which are carried out through threats, imposition, and terrorism. In degraded lands and among peoples in grave difficulties, these Christians, the Christian communities and Christianity, are resources of humanity”. “All Churches to engage more in dialogue and co-operation with other faith communities, and be “as wise as serpents and innocent as doves (Matthew 10:16) by remaining vigilant, watchful and fearless in the face of discrimination and persecution. “All governments to respect and protect the freedom of religion or belief of all people as a fundamental human right. We also appeal to governments and international organisations to respect and protect Christians and all other people of goodwill from threats and violence committed in the name of religion. In addition, we ask them to work for peace and reconciliation, to seek the settlement of on-going conflicts, and to stop the flow of arms, especially to violators of human rights. “All media to report in an appropriate and unbiased way on violations of religious freedom, including the discrimination and persecution of Christians as well as of other faith communities”. 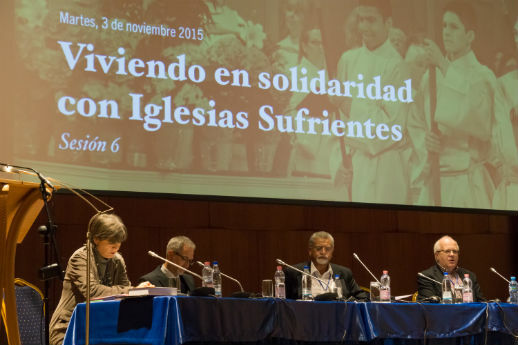 The consultation, entitled Discrimination, Persecution, Martyrdom: Following Christ Together, was convened by the Global Christian Forum together with the Roman Catholic Pontifical Council for Promoting Christian Unity; the Pentecostal World Fellowship; the World Evangelical Alliance; and the World Council of Churches. It was organised in close collaboration with the Orthodox Autocephalous Church of Albania, the Albanian Bishops’ Conference, and the Evangelical Alliance of Albania.